It’s a brand new year with an even tighter budget. Eeek! Since Larry and I are not into living a life of deprivation we decided to explore what we absolutely had to have besides our basic needs. Eating, cooking and entertaining were our top priorities. It’s not unusual for us to entertain friends over a home cooked meal at least three-four times a month. So how were we going to accomplish this within our budget? We decided to have two ways of entertaining. One would be to have simple suppers with a one dish entree. No frills such as dessert or appetizer, just a spontaneous invite to join us for our normal weekday meal. We also wanted to continue having themed based dinner parties serving a complete meal of appetizer,main course,side dish and dessert. We decided to set a budget of $20 for each dinner. How would we be able to accomplish this? Here’s what we came up with. First we would ask our guests to contribute to the meal by bringing a beverage of choice and an appetizer, salad or dessert. We would cook the main dish and whatever else needed. In addition we would limit the number of guests to a maximum of four. It would be a win-win situation for all of us. Our guest would be spending less than they would in a restaurant and they would also have the opportunity to learn how to make a new dish with the recipes I provided. I decided upon a Cuban menu this month since a bunch of us were going to a local club to learn a new (for us) kind of Cuban dance called Son. Here’s what we made. Cut yucca into 4 inch lengths. Leave peels on yucca. Steam them until knife cuts into them and they are soft ( not mushy) like potatoes. Cool and strip peels off. 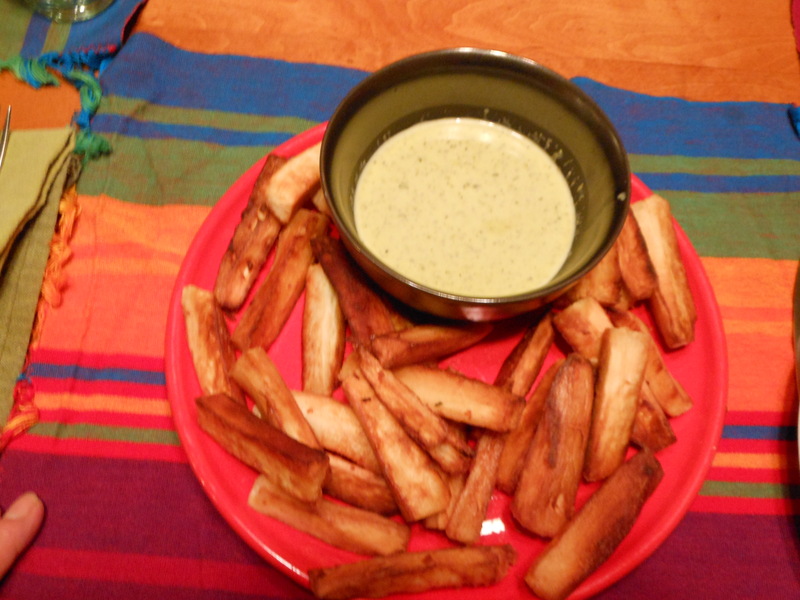 Cut into french fry size wedges. Fry in hot oil until brown on all sides and sprinkle with salt. Crush and pulverize garlic cloves with salt and pepper. Add cumin powder. Combine garlic mixture, vinegar, orange,lime juice and olive oil in blender and blend until frothy. Add chopped cilantro and adjust with more salt as needed. 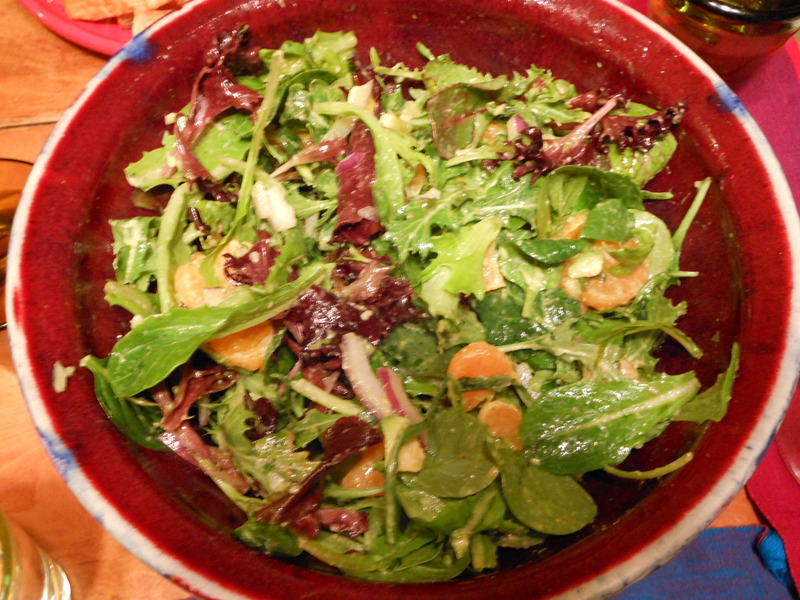 Toss ingredients above gently with vinaigrette. Mash and pulverize garlic with salt. Combine with lime rind,juice, shallots and chili. Toast cumin and coriander seeds until fragrant. Cool and then grind into a fine powder. Add to lime mixture. Whisk in mustard and oil. Taste and adjust with more salt if needed. Let rest for 15 minutes and add cilantro just serving. Cut each chicken breast into 2 half pieces. Marinate the chicken breasts and thighs with the garlic, salt, pepper, oregano,cumin,coriander and red wine vinegar for 6-24 hours. Refrigerate. In a large oven proof pan, fry chicken pieces over medium high heat in oil until browned on all sides. They should not be cooked through. Set aside chicken when browned and saute the onion and garlic with the oil from fried chicken. Saute onions until soft and yellow. Add bell pepper slices and cook for 3 minutes. Add the tomatoes and cook at medium flame until the tomatoes are soft and juices have been released. Add beer and chicken stock and bring to a boil. Add rice and mix thoroughly. Turn off heat and place chicken pieces decoratively over rice. Place a foil over the pan and bake in oven at 350 degrees for 1 hour. 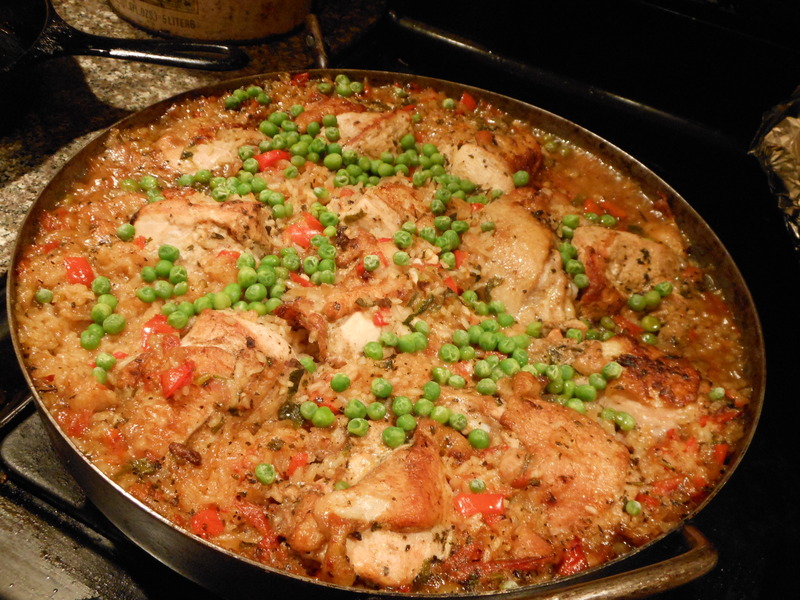 Take foil off and sprinkle peas over rice and chicken and bake for 10 minutes longer. Rice will be soft and almost soupy. I like the rice to be soft and almost risotto like in texture. If you want it to be drier, bake it a bit longer uncovered. 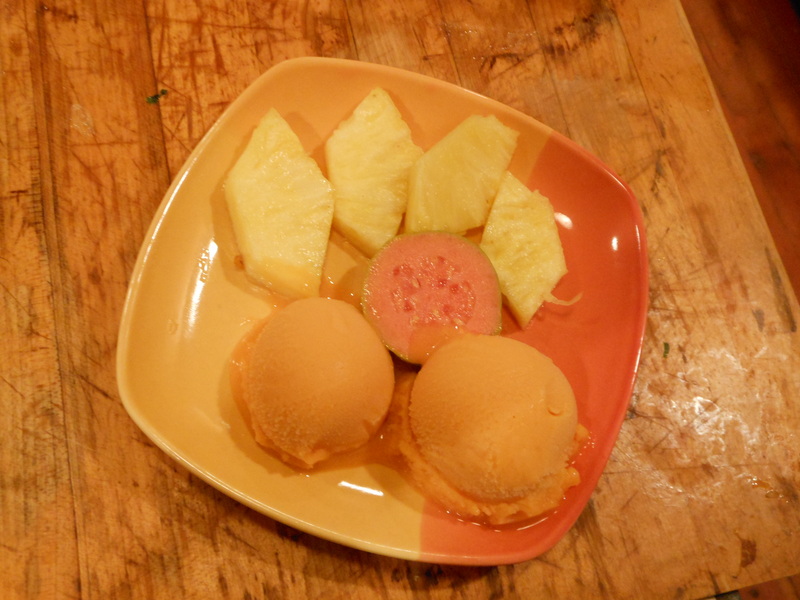 Cut pineapple into small wedges and serve with scoops of store bought mango sorbet. *If you are able to find fresh guava, include on plate. It really amounted to less since I bought two whole chickens and was able to use the drumsticks and wings for another meal. There’s a renaissance of creativity erupting in this country. Out of necessity people are making all sorts of wonderful things from found items. In my quest to “Waste Not, Want Not” I’ve been making my ever changing mac n’cheese. I love the alchemy that takes place when I use leftover cheeses from my fridge to make this dish. 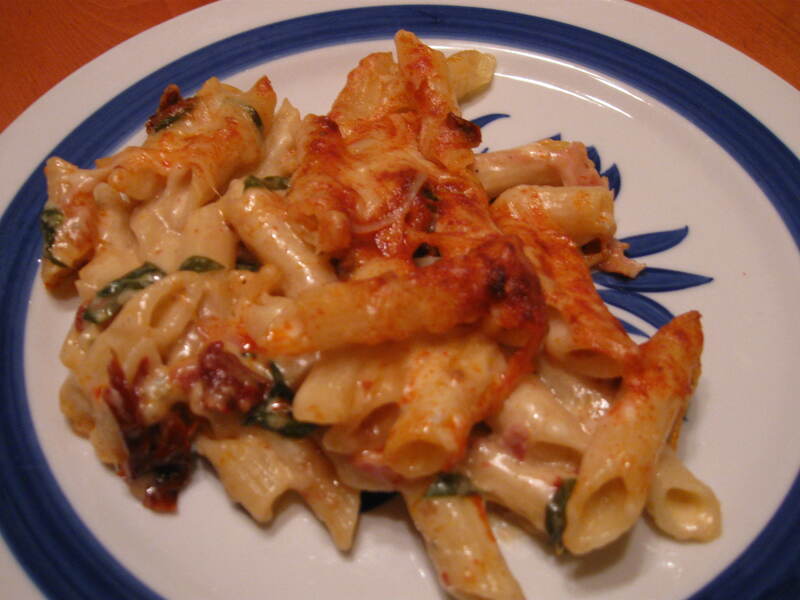 Homely scraps, wedges and lumps of different cheeses go into a white sauce that’s mixed with penne macaroni and then covered with parmesan cheese. 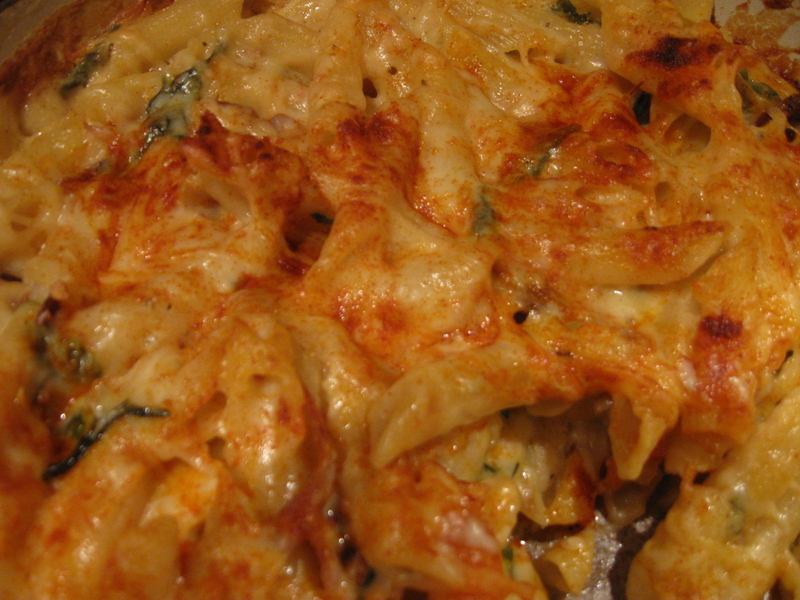 Baked until golden brown,the interior of this dish emerges loaded with toothsome pieces of pasta bathed in a complex sauce of many cheeses. It’s magical how all the flavors deliciously merge and meld into each other. At different times I’ve used bits of brie, fontina, gorgonzola, manchego, cheddar, provolone, gruyere, parmesan, and asiago.It always turns out delicious. If I have some leftover bits of ham or prosciutto I’ll add them as well. Sometimes a mound of caramelized onions,handful of spinach or sun dried tomatoes get thrown in.The fun part of this dish is using whatever that’s available and experiencing something new each time. The only things I don’t change are the proportions for the white sauce and cheese. Using the Silver Palate recipe for Macaroni with Quattro Formaggi as a template I’ve been able to create my own take on their recipe by adding dijon mustard and different types of cheeses and ingredients. My latest creation had mostly provolone,some gorgonzola, asiago, and fontina cheese. I also threw in some strips of fried prosciutto, sun dried tomatoes and a handful of spinach leaves. 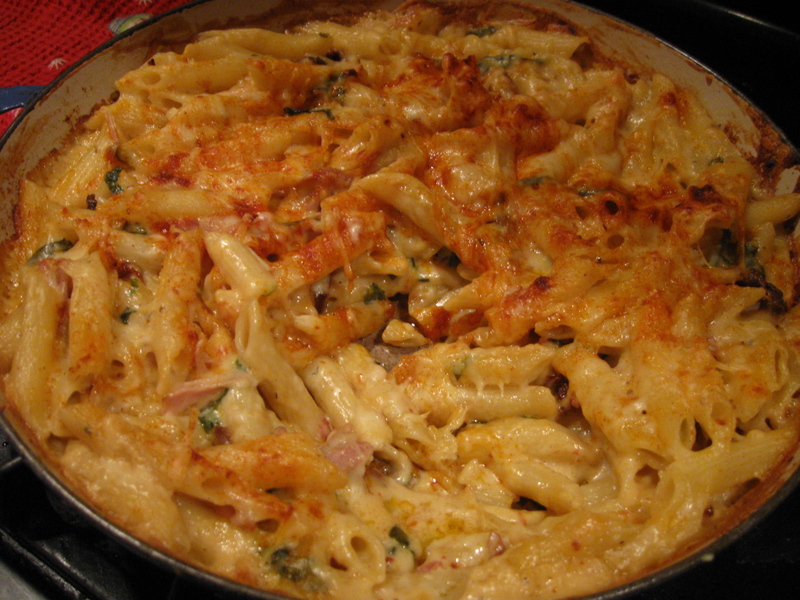 I topped it with a mixture of parmesan and asiago cheese.Try this recipe and then try putting in your own combination of cheeses and ingredients to make your own Magical Mystical Mac N’Cheese. Boil penne until al dente. Drain and set aside. Time for Strawberry-Rhubarb pie !